Dr. Brian Goldman is both an emergency room physician at Mount Sinai and a prominent medical journalist. Never one to shy away from controversy, Goldman specializes in kicking open the doors to the medical establishment, revealing what really goes on behind the scenes — and in the minds of doctors and nurses. In The Night Shift, Goldman shares his experiences in the witching hours at Mount Sinai Hospital in downtown Toronto. We meet the kinds of patients who walk into an ER after midnight: late-night revellers injured on their way home after last call, teens assaulted in the streets by other teens and a woman who punches another woman out of jealousy over a man. But Goldman also reveals the emotional, heartbreaking side of everyday ER visits: adult children forced to make life and death decisions about critically ill parents, victims of sexual assault, and mentally ill and homeless patients looking for understanding and a quick fix in the twenty-four-hour waiting room. 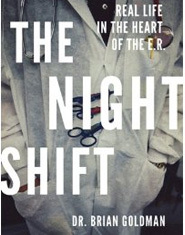 Written with Goldman’s trademark honesty and with surprising humour, The Night Shift is also a frank look at many issues facing the medical profession today, and offers a highly compelling inside view into an often shrouded world. A photo exhibition on display at the Kellogg Library shows the last days of the old Halifax Infirmary. Just prior to demolition in 2005, photographer Angela Carlsen was allowed access to the building for just two hours. Donning a hard hat, she was able to capture remnants of the once-thriving hospital in a series of colour photos that illustrate its last dying days. She loaned the framed photos to the Kellogg Library for the exhibition. Read the story in the Dal News.